This is an article from the October 29th issue of Pascack Valley Community Life. "Old Post Office" wins award at N.E.W.S. show. 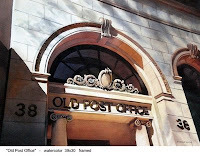 My painting, "Old Post Office" received the Air Float Award at the North East Watercolor Society, 32nd Annual International Open Exhibition. The exhibition is at The Gallery at Kent Art Association, Kent CT. from Oct. 23rd to Nov. 9th. This is another painting in the Hudson River Series. It depicts part of a marina in the Hudson River at Piermont NY. with the wide expanse of the Tappan Zee (the widest part of the Hudson River north of NY harbor) and Hook Mountain in the background. The town of Nyack (home of Edward Hopper) is on the left, and if you look closely you can see long haul truck traffic on the causway of the Tappan Zee bridge. Boat House on the Hudson receives award. My watercolor "Boat House on the Hudson" has received the Norman Webb Award at the New Jersey Watercolor Society 66th Annual Open Juried Exhibition. There is a Reception on Sunday, October 19th, 2pm-4pm. This is another image in the Hudson River/Hook Mountain series. The view is looking north from a pier in the Hudson River at Piermont, NY. Do you have an idea of what it should be named?